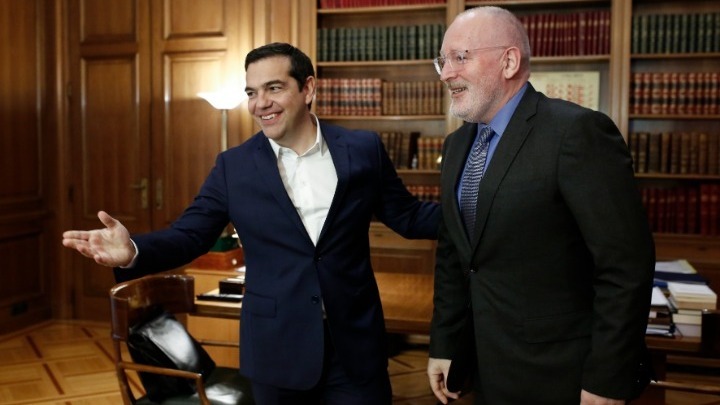 The Greek Prime Minister met today at his office with the Socialist candidate for the presidency, Frans Timmermans. Alexis Tsipras reiterated the need to create a progressive front in Europe to stop the right and right-wing forces. In this context, Al. Tsipras described the Prespes Agreement as an “important progressive step”, stressing the support of the Socialists in this direction, saying with meaning that if the two countries had conservative governments, there would have been no agreement. A message directed not so much at Frans Timmermans but at Fofi Gennimata, as KINAL voted against the Agreement by adopting a large part of New Democracy’s rhetoric. At a time when in European it is becoming increasingly commonplace for social democracy to form convergence and alliances with the Left and the Greens, KINAL – belonging to the family of the European Socialists and Democrats of F. Timmermans – insists on the need for SYRIZA’s defeat. Besides, the candidate of the Euro-socialists himself at the KINAL conference, has set as a strategic goal the ending of austerity, through the cooperation of the progressive forces: “No matter what the differences are, they are nothing compared to the consequences of the prevalence of the Right. We need to be united to create a Europe with social principles and cohesion, a Europe with a rule of law”, he noted inter alia.